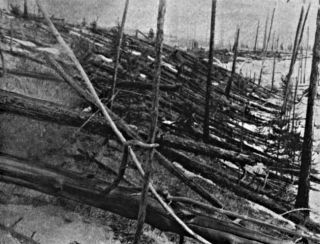 The Tunguska explosion flattened some 500,000 acres of Siberian forest on June 30, 1908. This image is from the Leonid Kulik expedition in 1927. A full century after the mysterious Tunguska explosion in Siberia leveled an area nearly the size of Tokyo, debate continues over what caused it. Many questions remain as to what crashed into the Earth from above -- how big it was and what it was made of. Some question whether it even came from space at all, or whether it erupted from the ground instead. And there is always speculation that it was caused by a UFO or famed inventor Nikola Tesla's "death ray." The explosion near the Podkamennaya Tunguska River on June 30, 1908, flattened some 500,000 acres (2,000 square kilometers) of Siberian forest. Scientists calculated the Tunguska explosion could have been roughly as strong as 10 megatons to 20 megatons of TNT -- 1,000 times more powerful than the atom bomb dropped on Hiroshima. The longstanding theory regarding the cause of the event is a cosmic impact from an asteroid or comet. In the last decade, researchers have conjectured the event was triggered by an asteroid exploding in Earth's atmosphere and measuring roughly 100 feet wide (30 meters) and 617,300 tons (560,000 metric tons) in mass -- more than 10 times that of the Titanic. But recent supercomputer simulations suggest the asteroid that caused the extensive damage was much smaller. Specifically, physicist Mark Boslough at Sandia National Laboratory in Albuquerque, N.M., and his colleagues say it would have been a factor of three or four times smaller in mass and perhaps 65 feet (20 meters) in diameter. As the asteroid exploded as it ran into Earth's atmosphere, Boslough and colleagues calculate it would have generated a supersonic jet of expanding superheated gas. This fireball would have caused blast waves that were stronger at the surface than previously thought. At the same time, prior estimates may have overstated the devastation the event caused. The forest back then was unhealthy, according to foresters, so it would not have taken as much energy to blow down such trees. In addition, the winds from the explosion would naturally get amplified above ridgelines, making the explosion seem more powerful than it actually was. What researchers had thought to be an explosion between 10 and 20 megatons was more likely only 3 to 5 megatons, Boslough said. As to whether the impact was similar to a stony, carbonaceous asteroid or a comet, "while the community has pretty much accepted the view that it was a carbonaceous asteroid, I'm not sure it's a slam dunk," Boslough said. "The main argument against it being a comet is statistical. There are a lot more small Earth-crossing asteroids than comets at least by a couple orders of magnitude. While it's unlikely to be a comet, I'm not convinced it's physically impossible." Discovering the size and makeup of whatever hit at Tunguska could shed light on how often such a devastating impact might take place, explained NASA Ames Research Center planetary scientist and astrobiologist David Morrison. "As interesting though Tunguska is, I'm more interested in the next Tunguska," Morrison told SPACE.com. "We know small objects are far more numerous than large ones out there, so we want to see how much damage they might be able to do." Instead of a cause from above, in the last decade some researchers have suggested the Tunguska explosion actually came from below. Astrophysicist Wolfgang Kundt at the University of Bonn in Germany and others have suggested that an eruption of natural gas from kimberlite, a kind of volcanic rock best known for sometimes holding diamonds, could be to blame. "It would have come from the molten earth, some 3,000 kilometers deep (1,864 miles)," Kundt said. "The natural gas would be stored as a fluid that deep, and when it reaches the surface it would become a gas and expand by a factor of thousand in volume, for a huge explosion." For support, he cited the pattern the trees fell in, as well as chemical anomalies. A UFO crash. Struck by the similarity of Tunguska and Hiroshima decades later, a science fiction writer named Alexander Kazantsev wrote a story in which the Tunguska blast was the exploding nuclear power plant of a spaceship from Mars. A few Russian scientists took up the cause and claimed to find various bits of evidence -- never substantiated -- for a civilized alien explanation. The annihilation of a chunk of antimatter from space. This does not account for mineral debris the explosion left behind. A black hole zipping through Earth. This also does not account for mineral debris the explosion left behind, and there was no subsequent explosion as such a black hole, having tunneled through the Earth, would have shot back out through the surface of the Atlantic. A Nikola Tesla "death ray." The man who pioneered radio and modern alternating current electric power (AC) systems was often seen as a mad scientist. One story alleges he test-fired a death ray on the evening of June 30, 1908, and once he found out about the Tunguska event, he dismantled the weapon, deeming it too dangerous to remain in existence. All the speculation concerning Tunguska is to be expected, Boslough said. "Lots of theories are going to pop up -- it's like a crime scene, and everyone wants to have a hand in solving the mystery," he commented. "It's fun to speculate."